„Klimaschutz ist langweilig, und außerdem können wir sowieso nichts machen.“ – Irrtum: Klimaschutz berührt fast alle Lebensbereiche und ist so vielfältig wie das Leben selbst. In ihrer eigenen Schule können Schüler Probleme des Klimawandels erforschen, Strategien zum Klimaschutz erarbeiten und folgenreich Maßnahmen initiieren. In diesem Sinne bietet die Broschüre „Klimadetektive in der Schule“ Anleitungen für einen schulischen „Klimacheck“. The Environmental Office North (UBN) in the Hanseatic Grammar School (Hansa-Gymnasium) Stralsund performed the plane game “triCO2lor” (www.trico2lor.ch). It wa part of the co-operation with the Comenius schools network, led by the Hanseatic Grammar School. 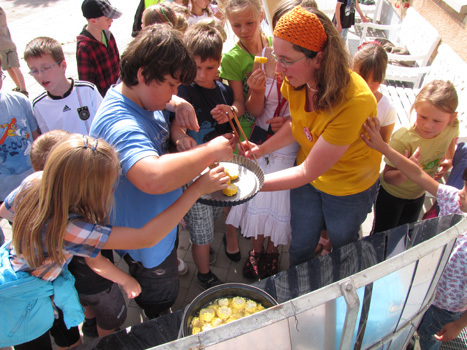 25 secondary students and their teachers from Austria, France and Germany took part. In general, plane games aim at active and constructive learning. The participants have to play pre-defined roles in a pre-defined game arrangement, but they are free to act in their own fashion. They, thus, simulate real life, and they can experience the impacts / consequences, their actions would have in real life. These experiences are discussed / reflected afterwards, under moderation of the trainee. This, hopefully, should lead to a deeper insight into real life systems, and it should enable the participants to act in a more reflected and responsible fashion in the future. In the special case, triCO2lor is a plan game on our energy consumption. The participants act as consumers, which are purchasing energy. They can purchase fossil energy (including nuclear energy), renewable energy, or they can improve energy efficiency and, thus, consume less. For all that, they have to pay, and the winner is the player, who does so in the most economic way and, thus, has the most money at the end of the game. This is not easy, because the prices for the different kinds of energy are changing during the game, and because the actions of the participants influence each other. And of course, the consumers decisions have environmental impacts (=emission of CO2 and, as a consequence, global warming), which are calculated by computer. It should be mentioned, that the participants in triCO2lor are divided in (e.g.) four groups. Each group stands for one generation of human beings. The consumer decisions of one generation will influence the next generation. The plane game can make the students aware the environmental impacts of production and use of energy, and it can stimulate them to consider their own role in the energy revolution. UBN could experience, that the plane game triCO2lor “does work”, even under challenging conditions (the participants came from three nations and had to communicate in a foreign language + it was the first time for UBN to use this plane game). The students (and teachers) acted very actively, and their feedback was positive. As a consequence, UBN used triCO2lor another two times during the following months. The game system does not represent the real life system in an appropriate fashion: There is a plan with an oval – like in a sports stadium. To represent the progressive consumption of energy, the players put their coins at this oval (see picture). This is not a catchy metaphor / picture, and this is really a crucial aspect, because many youngsters are not able to act at an abstract level – they would need catchy metaphors. The environmental impacts have to be calculated at the platform www.trico2lor.ch. The global warming is there illustrated at a coloured world map. This is not user friendly: The colours do only represent the actual situation (not the development since the beginning of the game), and it is impossible to display the whole website at a beamer (too big). This problem was fixed by UBN, we created our own Excel-sheet, which is much better to use than the website. In the reality, global warming will influence the human civilisation – and every human being – very strict. This is not represented in triCO2lor sufficiently. As a consequence, UBN introduced occurrences/incidents into the game. At certain levels of global warming, incidents occur, the participants are informed by incidents sheets – and they are free to review their strategy as individuals, in their generation or as the whole community. We introduced such incidents already at the second use of triCO2lor. In general, it works well, because it leads to strong discussion between the participants and to a deeper reflection of consumer strategies. But the incident sheets should be further improved. try to develop its own plane game (we already applied for funding, it shall be realized 2011-2012). On 14.3.2010, EGS partner ZIEL 21 held a training session together with the Ökologisches Bildungszentrum München. The pupils who took part in this course are those committed to energy saving and efficient handling of energy as the energy officer for their class. Now, they are back at school, invigorated for their task and equipped with a pupil activity book. All energy officers at the Viscardi Gymnasium, the Gymnasium in Gröbenzell and Germering’s Max-Born-Gymnasium could take part. What does eating have to do with climate protection? How much energy do I use at home and at school? What energy saving tips can I pass on to my fellow students? If a lesson is cancelled, what films can I organise on the subject of climate protection and energy transformation? What are renewable raw materials and how do they work in practice? What new ideas relating to energy efficiency can I implement at school?